Tropical islands with white sand beaches, the fjords and mountains of higher latitudes and dramatically barren coastlines all have their fans among cruising yachtsmen, but, without doubt, the world’s most popular destination is the Mediterranean’s long and varied northern coastline. The area offers so much, from warm waters to settled summer weather, superb scenery, fine dining, luxury shopping and historical interest, that many yachtsmen will spend their whole cruising lives within its confines. An invitation to catch up with the motor yacht Dionea for a short Mediterranean cruise from the southern French city of Nice to Italy’s Portofino offered the perfect opportunity to revisit the popular yachting region. Nice is a particularly convenient starting point as its international airport boasts direct connections with most major cities. Launched in 1962 at the Felszegi shipyard in Muggia, Italy, 171-foot Dionea operated as a high-quality 300-passenger ferry on the Triesteto- Istria run until 1991. In 2003, the Mariotti shipyard in Genoa and her owners gave her new life. A tasteful conversion preserved her classically attractive character, giving her a persona that blends well with the ancient cities and towns that we are about to visit. A cultural cruise along the Riviera has us calling in at the most interesting ports between Nice and Italy’s iconic fishing village of Portofino—today the classy Saint-Tropez of the Italian Riviera. Historically speaking—before the unification of Italy in 1860—this whole area, including the city of Nice, was part of the Kingdom of Piedmont, and a great deal of this Piedmontese/Italian heritage unifies this stretch of coastline’s architecture and culture. Nice, lacking the glamor of Cannes or Antibes, is often overlooked by charter guests, but it’s fascinating. Its well-protected harbor, nestled beneath the eastern flank of the imposing Colline du Château, is a great starting point for a walking tour. A five-minute walk takes us to Place Garibaldi, which boasts a huge statue honoring city native Giuseppe Garibaldi, a merchant-marine captain turned army general and one of the leading lights in the unification of Italy. The square also boasts what is widely acknowledged as Nice’s best seafood restaurant, Café de Turin, where diners can buy their dish fresh from an upmarket stall outside and have it cooked to perfection within. From there it is just a stone’s throw to the old town—a maze of narrow pedestrian streets that overflow with a fascinating mix of food, fashion and tourist shops, as well as the occasional palace and baroque church. The walk eventually leads to Cours Saleya, an open area that typifies the city’s lifestyle, with a daily market that boasts mouthwatering produce and colorful fresh flowers. All around are restaurants with terraces as tempting for a coffee and newspaper as they are for a seriously good lunch or dinner. Visible through an archway is the sea and the start of the long westward curve of the celebrated Promenade des Anglais, named for the British elite who in the 18th century helped establish Nice as a winter vacation resort. this page Dionea’s Italian chef, Franco Solari, gives pasta-making lessons to guests (top left). The colorful buildings of Portofino, a picture-perfect fishing village, catch the eye (center). Tempting delicatessens are a feature of every street in the region (bottom left). The Baroque façade of Saint Michael the Archangel in Menton, France, was featured in a Bond movie (bottom right). Back on board, we watch the coastline as Dionea steams majestically eastwards past the popular anchorage of Villefranche—for us, too full of cruise ships and yachts—and the always-crowded Monaco, to drop anchor for the night off the genteel French resort of Menton, often described as the “Pearl of France.” Here, Dionea is the only yacht in the anchorage as we dine against a backdrop of historical architecture, including a distinctive and well-known church. Its steps were once the stage of a motorcycle chase in the James Bond movie Never Say Never Again. The next day, we retrace Bond’s route in reverse, climbing the steep steps to the church. The views from the hilltop cemetery occupied by many of the notable European and Russian nobles (as well as William Webb-Ellis, the purported founder of rugby football) who chose to spend their twilight years in the resort town. Below, the narrow medieval streets with their shops and cafés open out past a beautiful market building to an attractive restaurant-lined promenade, where we stroll before turning back towards the harbor for a sumptuous lunch. Dionea’s Italian chef, Franco Solari, demonstrates his particular skill with mushroom pasta, followed by fresh sea bass with grilled courgette and homemade caramel ice cream. That afternoon we meander eastwards, crossing into Italy “proper.” We pass the much-admired botanical gardens at Villa Hanbury, now a UNESCO World Heritage site, near the border town of Ventimiglia. Sir Thomas Hanbury, an Englishman who made his fortune as a Shanghai silk merchant, established the gardens in the 1870s. Today, 22 acres are under cultivation with a charming mix of indigenous Mediterranean and exotic plants, plus ornamental features such as a bronze dragon fountain from Kyoto and the Moorish mausoleum that holds the ashes of Sir Thomas and Lady Hanbury. Beyond Ventimiglia, the foothills that rise towards the Ligurian Alps’ majestic peaks become increasingly dotted with greenhouses. Italy’s Riviera dei Fiori is named after the long-established flower-cultivation industry based around San Remo. Today, San Remo’s principal businesses are tourism and yachting, as becomes apparent as we enter its large harbor, home to yachts of all types and sizes. Soon we are exploring San Remo’s charmingly narrow pedestrian streets lined with designer boutiques, delicatessens and enticing restaurants, as well as an abundance of bakers, fishmongers, grocers and butchers—supermarkets are still relatively rare in Italy. Our next stop is Imperia, a rather grand name for the two smallish towns of Porto Maurizio and Oneglia that were amalgamated in 1923 by order of Mussolini. As a result, Imperia has two harbors, today both largely devoted to yachts, one in Porto Maurizio and a more charming one in the old port of Oneglia, where Captain Claudio Intrigliolo berths Dionea for the night, her stern close to a line of restaurants located behind the arched colonnade that borders the quay. Our mission the next day was to visit the village of Bussana Vecchia, a few miles inland from Imperia. An earthquake in 1887 destroyed the village, killing 2,000 inhabitants, and it was subsequently abandoned until the mid-20th century when a growing colony of artists settled there, seeking a simple life of creativity. Despite several attempts by the authorities to evict them and the lack of running water and electricity, they remain today, creating and selling their art to visitors. A narrow and twisty approach road ends at a delightful barbecue restaurant with amazing views where we stop for coffee, before climbing up a steep path to the village itself. There we spend an interesting hour amid occupied houses and their art-filled studios that sit cheek by jowl with total ruins in a disarmingly attractive jumble. That afternoon we enjoy a scenic coastal cruise from Imperia to historic Genoa—the region’s capital—along an almost continuously built-up shoreline backed by high mountain peaks and threaded by the amazing engineering of the coastal Autostrada highway. A surprise awaits us when we dock in a private berth near Genoa’s historic city center. Vincenzo Vita, the owner of the Vita vineyards in Manduria, in Italy’s southern region of Apulia, joins us at a private villa where we enjoy his wines. Made from relatively rare and exclusive grape varieties, such as Primitivo, Sussumaniello, Fiano Minutolo and Negramaro, they are beautifully paired with the fare of Dionea’s Chef Solari. 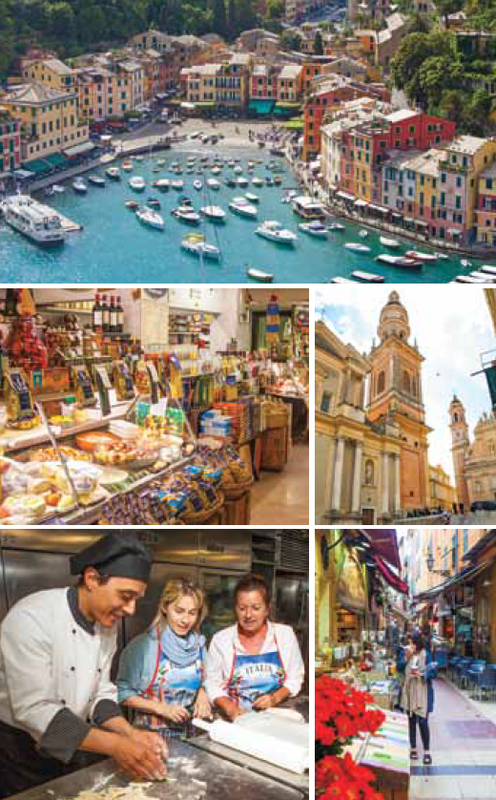 Genoa is so large that it is impossible to get an instant overview without help from a guide. Anna Sartori, our guide for the next day, gives us insight into a city whose vast medieval wealth has been founded on international maritime trading and investment banking. America might today be Italian speaking had not Genoese bankers refused to finance Columbus’ voyage on grounds of excessive risk. this page Just east of Genoa, the beach at Boccadasse, was once full of fishing boats—today few remain (top left). 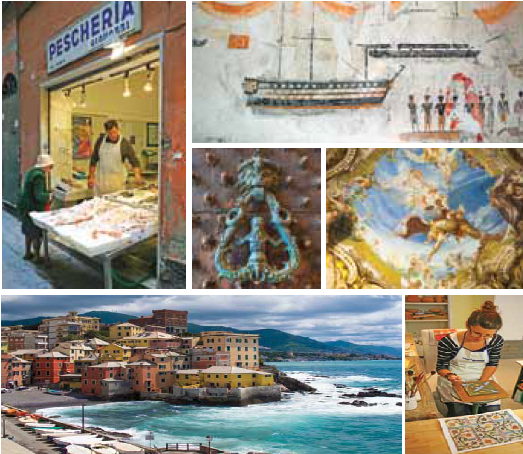 Spurred on by the need for restoring frescoes, like those of the Palazzo Rosso (bottom right) and historic graffiti from the Palazzo Ducale (center right), artists are relearning ancient crafts in Genoa’s L’aria del Mare shop and workshop (top right). The city’s wealth is evident from the many richly decorated palaces that line the old city’s narrow streets, although most of them, sadly, are in disrepair or have been converted for commercial use. We stop briefly to peer into their once-sumptuous courtyards and gaze into shops long disappeared from most towns—a traditional barber shop and a well-stocked delicatessen— before heading uptown to the Palazzo Ducale, the former ruler’s abode. Erected in 1251, this building was designed to impress—and it still does, with its sumptuous frescoed halls and vast atriums. On the darker side, its Grimaldina Tower was, until 1930, a notorious jail for political prisoners, noblemen and sea captains, as the frescoes of sailing warships in one of the more habitable cells indicate. Next, we head to Strada Nuova (it was new in 1550) and its imposing must-see palaces. Foremost among these is the Palazzo Rosso, dating from 1671, which is today the city’s most important art gallery, exhibiting paintings from Anthony Van Dyck, Paolo Veronese and Albrecht Dürer, as well as incredible frescoed ceilings.